With so many health careers to choose from, have you considered job stability as well? Given the global economic downturn, greater numbers of people are thinking about choosing a career that to a large extent will be recession-proof. This means that they will work in a role that is an essential one through the highs and lows of the economy. It is important to keep in mind that no career is completely recession proof, meaning you cannot be guaranteed a job at all times. Many people will find, however, that the following health careers offer higher job stability than other health careers. When it comes to family planning and future financial stability, ensuring you choose a recession proof health career could be your best option. Dental hygienists are important for helping patients to achieve and maintain healthy teeth while preventing decay and disease. They play a primary role in cleaning the teeth of patients on a regular basis by removing plaque and advising them on proper oral hygiene. Also, they assist dentists in surgery and related dental procedures. Dental hygienists benefit from a solid wage with minimal schooling. As the demand for quality dental care continues to increase steadily, the demand for excellent dental hygienists similarly increases. Today's dental hygienists are particularly well trained, allowing them to take over some of the tasks normally attributed to a dentist. In turn, a dental practice can weather the recession through increased efficiency. Much of the increased demand can further be attributed to a growing number of new generation dentists. Such dentists are more likely to hire dental hygienists than older dentists. In addition to working within a dental office, many dental hygienists can work independently in their own cleaning practice. They will then refer patients to dentists – often for a fee – as needed for work requiring a registered professional dentist. Laboratory technicians play a critical role in helping physicians and specialists to diagnose disease. They can work and specialise in many areas such as haematology or microbiology. They analyse bodily fluids such as blood or urine as well as tissue samples to determine if the patient tests within a normal or abnormal range for a specific marker of health. Even in a recession, the career of a laboratory technician is a stable one. In fact, some research suggests that the demand can increase during a recession as people cut corners on their lifestyle choices, particularly where health is concerned. The result can be an increase in stress and disease, warranting increased trips to the doctor’s office. A physician assistant is considered a ‘mini-doctor’ who performs much of the same work as a doctor, including writing prescriptions. Their presence in medicine has skyrocketed over the last decade, namely because they play such an important role but still demand a lower salary than a typical physician. As more and more hospitals and healthcare establishments seek to limit costs, especially during a recession, the demand for physician assistants goes up. The salary is still high but again, less than that of a physician. Optometrists are key to helping people attain good eye health and vision. As the population ages and visual problems occur with more frequency as people age, the demand for optometrists rises. Visual aids are common in the elderly and as the technology for providing such visual aids advances at a rapid pace, there is a heavy need for qualified optometrists. 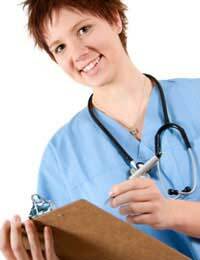 Registered nurses are often seen as the backbone of healthcare around the world. They provide everything from daily care in hospitals to the administration of medicines, pre- and post-operative care, and monitoring of patients’ signs and symptoms. Even in a recession, their role remains a critical one. As with some health careers, their use in a recession can increase with them taking over roles not normally reserved for nurses. As healthcare providers seek to cut costs and patient numbers may increase during a recession, the role of a nurse can become more important than ever. As with any health career, one of the best first steps is to speak to people who already work in the health role. A few days of job shadowing can enlighten you on what’s involved. As much as you may be seeking a recession proof health career, you also need one that you can enjoy and that will give you job satisfaction. Talking to a career adviser at a university or your school if you’re still in school can be enormously helpful. No career is one hundred percent recession proof. But consider one of the health careers discussed here to reduce your risks of career problems or unemployment during a recession.